Back in the 1980s, my family and I took a trip to visit our friends, the Bremers. We all used to live next door, but the Bremers had moved away a decade prior. As our parents were reminiscing on old times, one of the Bremer teens pulled out a 8mm movie projector and we watched home movies his dad had shot of us playing together in the backyard: on the swings, the see-saw, and running about. What I wouldn’t give to see that footage today! It would be the only video of my sisters and me as kids. Perhaps Mr. Bremer digitized his home movie collection before he passed away. But it’s more likely his children inherited the box of reels, and it’s now buried and decaying in a closet (or gone entirely). And, if they had the tape, would they have a projector or anything to play it? What a pity. Those precious moments captured once upon a time on film are probably lost forever. Obsolescence isn’t just a concern for home video enthusiasts. 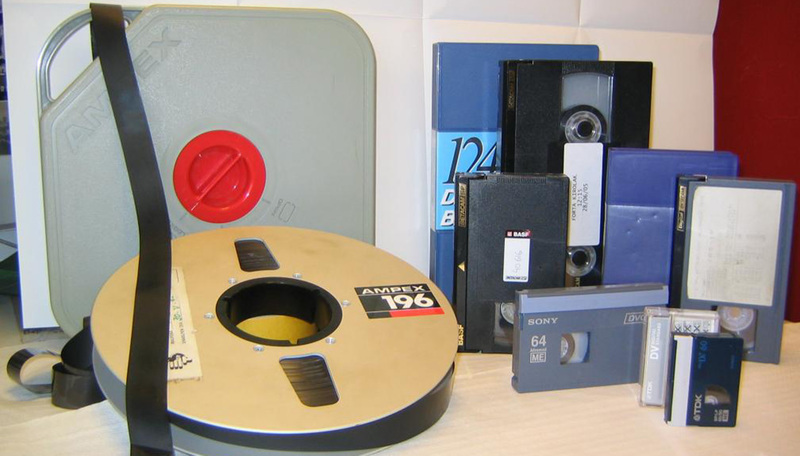 Professional content creators likely have content stored on obsolete technology, whether it’s videotape, LTO digital tape, or external drives. And unlike the simplicity of Mr. Brehmer’s film reels and projectors, there are many more factors that can make digital content inaccessible. The most obvious issue is storage media degradation. If film is carefully stored in a cold, dry environment, it can last an extremely long time. Yet for both videotape and digital tape, there are a myriad of pitfalls: magnetic particles can lose their charge; the tape substrate can deteriorate; and heavily used tapes can stretch. Tapes over 15 years old are at greatest risk, even if stored in the ideal conditions of low-heat and low-humidity. Hard disk drives have shortfalls too: mechanical failure, overheating, and power spikes. External drives in particular, are at risk of shock damage from being dropped. Even a drive standing on its side, then tipping over, can generate enough shock to damage the drive internals. At our Backblaze data centers, we replace disk drives after four years, and earlier for drive models that show higher-than-usual failure rates. We have ~100,000 drives in our data centers, and document which ones are more likely to fail in our quarterly drive stats posts. Even if the storage media remains intact and the data uncorrupted, the data format can become obsolete, often more quickly than you’d expect. For example, manufacturers of the commonly used LTO digital tape are now shipping LTO-8 and only guarantee two generations of backward compatibility. That means if you upgrade your tape system for higher-capacity 12TB LTO-8 tapes, you won’t be able to read the LTO-6 tapes that were introduced just six years ago. Also, if the file data itself was encoded in a proprietary format, you’ll likely need proprietary software installed on a computer running a potentially outdated operating system version to be able to read its data. This is a bigger topic than we’ll cover today, because there can be layers of encoding involved: backup formats, graphics formats, codecs, etc. But suffice to say that you might find yourself having to hunt down a Mac that’s still running macOS X Leopard to migrate some content. Not sure how much your content is at risk? The Museum of Obsolete Media rates all imaginable media types on both media stability and obsolescence, from Endangered to In Use. Spoiler alert: VHS tapes are rated Endangered for media stability and rated Vulnerable for obsolescence. Determine which content is obsolete or at risk. Choose a media and format for the new archive, and calculate whether you can afford to migrate everything. If not, decide what you can afford to lose forever. Gather all the tapes or drives to be migrated. Are you sure you have the complete set? Your content spreadsheet might not be up to date. You might need to interview team members to gather any unwritten tribal knowledge about the backup sets. Identify a migration workstation or server that can run the application that wrote the archived media files. Attach the tape drive or disk device and test it. Can it still properly read, write, and then restore test files? Using a checklist system, feed tapes into the drive or attach the external drive in order. You might need to track down obscure adapters for older technologies like a SATA to EIDE adapter for parallel port disk drives, or a SCSI card and cables. Initiate the copy of all files to local storage. Hope you have enough space. Carefully monitor the entire process and make sure that all files are copied completely, and only then can you check the tape or disk off of your migration list. Then repeat with the next tape or disk. When you’re done extracting all the old files (or earlier if you’re pinched for disk space), reverse the process. Attach any needed devices and write the files to the new media. Cross your fingers that you bought enough tapes or disk drives (but not too many). Repeat again in 4-7 years before the new media ages or technologies change. If all of that sounds too painful, you can pay a transfer service to migrate your whole archive for you, but that’s not cheap, and remember you’ll have to pay to do it again sooner than you think. Alternatively, you can migrate content on-demand and cross your fingers that it’s still readable and that you can retrieve it fast enough. The longer you wait, the greater the risk of media failure. You might only get one shot at reading an old tape or film. Few find that an acceptable risk. You can break this migration cycle by migrating once to Backblaze B2 Cloud Storage. We’ll take over from there, moving your data to newer storage technologies as needed over time. Backblaze’s erasure coding technology that protects your data from loss happens to make upgrading technologies easier for us. Not that you need to worry about it; it’s included in our service. Moving to B2 Cloud Storage for your archive means you won’t have any hardware or media to purchase, manage, or house. No tapes or disks to buy, no clearing off shelf space as your archive grows. You won’t have to feed tapes into an autoloader every time you want to write or retrieve content from the archive. And moving to B2 Cloud Storage gives you the benefit of only paying for what you’re actually using. Pay-as-you-go means your storage costs move from a capital expense to an operating expense. Did you know that Backblaze B2 is the first cloud storage that’s more affordable than LTO storage solutions? If you want to see the math, check out our LTO vs B2 calculator. Enter the size of your existing archive and how much you expect to add each year and it will show you cost differences after 1-10 years. To understand its cost and operational assumptions, read our recent blog post, LTO Versus Cloud Storage Costs — the Math Revealed. It details the many factors for storage costs that many media professionals don’t always consider. The only thing worse than having a tape or disk you can’t read is having one that you can read go missing in action. Your content database or spreadsheet is only as accurate as what’s on the shelf. You may believe that an external drive is still in your archive closet when it went home over the weekend with a staff member and never came back. With B2 Cloud Storage, your archived content is stored in a central location that’s not only always accessible, it’s accessible from anywhere through a web browser. With Backblaze, you get a partner with over a decade of cloud storage experience. The erasure coding we use to encode data gives B2 customers a 99.999999999% durability (11 nines) rating for their data stored in our cloud. As NASA says, there’s higher probability of an asteroid destroying the planet than you losing a file with B2. Of course, you’ll still have to migrate once, but we can help make that final migration as painless and smart as possible. B2 Cloud Storage has several options for moving data—APIs, Web UI, CLI—plus our Fireball rapid ingest service for large data sets. We’ve also partnered with vendors and system integrators who have deep experience in managing media archives. If your current archive is on LTO tapes, we have a newly announced partnership with StorageDNA that can speed migration of LTFS archives. The Storage DNA Smart Migration bundle combines the latest version of their DNAfabric storage with Backblaze B2 cloud storage, plus an autoloading LTO library so you won’t waste time manually loading tapes. To learn more about how it works, register for our upcoming webinar, From LTO to the Cloud: Your Last Data Migration with Backblaze and StorageDNA, on Friday, December 14. Archive migrations are a great time to evaluate your asset management strategy. If you haven’t rolled out a media asset manager (MAM) yet, or you’re dissatisfied with your current one, know that more and more MAMs are integrated with cloud storage and can simplify collaboration across remote teams. With a cloud-integrated MAM solution, your content can be easily searched, filtered, sorted and previewed all from a web browser, from anywhere. To see B2 in action with a cloud MAM solution, watch our recent webinar, Three Steps to Making Your Cloud Media Archive Active with iconik and Backblaze B2. Finally, B2 isn’t just an archive solution, it’s great for backup, too. Most of our customers who archive content to B2 also back up active production data to the same B2 account. We have a growing list of backup, sync and other tools integrated with B2 to make the data movement to the cloud seamless and to make retrieval intuitive and straightforward. Pro Tip: syncing newly ingested footage or assets to B2 will spare you a big headache when someone accidentally deletes a critical file. If you have content that’s on media or in a format that’s aging fast, now’s the time to plan for its migration. By migrating it to B2 Cloud Storage, you can not only make it your last migration, it’s priced so that you can afford to migrate ALL your content. You never know what you’ll need, or when you’ll need it. And some content, like Mr. Bremer’s home movies, simply can’t be re-created. The post Breaking the Cycle of Archive Migrations With B2 Cloud Storage appeared first on Backblaze Blog | Cloud Storage & Cloud Backup.